® IGCSE is the registered trademark of Cambridge International Examinations. Section 1: How will you be tested? Section 3: What will be tested? What are the assessment objectives? 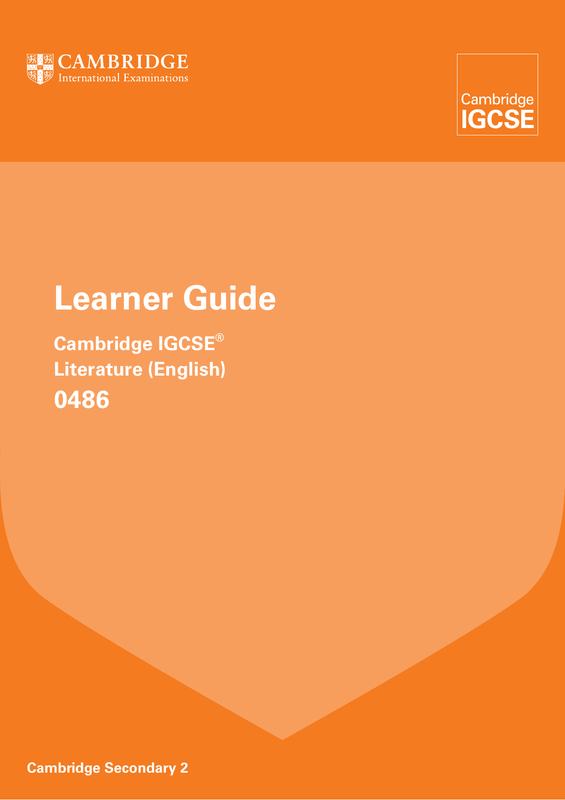 The guide describes what you need to know about your Cambridge IGCSE Literature (English) examination. some are based on the common mistakes that learners make in exams. test you on. There will be useful information, too, for those of you taking the coursework component. some of the important words in questions. Having read the earlier sections, you should now have the confidence to revise in an effective manner. you need to be clear about which option you are taking before you go on to Section 2 of this guide. What is the % of the total marks? If you are being prepared for the open text drama and unseen papers you will take three examination papers. For this option you will take two examination papers and one coursework component. What will you have to do in each paper? one on a prose text. passage-based and one essay) on each text. You must answer one question on one text. You must answer one question. and one based on a poem or extract of a poem). assignments each on a different text. You will find more detail about each of these papers in Section 3. You must answer two questions on two texts. This is relevant for all of the examination papers and also for the coursework option (if you are taking it). write legibly (with a good pen) in English that is as clear and accurate as you can make it. refer to writers by their first names; use their surnames. Poetry and one on Prose. Each of your questions must be on a different set text. passages are printed in the question paper. carefully and be prepared to probe it really closely. A few random or general points will not do at all. very particular focus that you need to address. explore how and why writers use such devices. integrate short quotations (a word or a phrase) and analytical comment on them. Before reading on, check that you are taking Component 2.
drama text you have studied. There will be a choice of two questions on each drama text. For each text, there will be one passagebased question and one essay question. 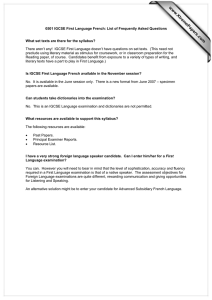 As with Component 1, you are not allowed access to your set texts in the examination. points on the previous page. Before you read on, check that you are taking Component 3. You have 45 minutes to answer one question on the set text you have studied for this paper. For each text there is a choice of two questions, one passage-based and one essay question. advantage of the fact that you have access to your text in the examination. You can only take this option if you are also preparing for Component 3 Drama (Open Text). or the prose unseen (on a passage from a novel or short story). comment on in your essay. A brief outline of what the poem or passage says (a few lines only) might be appropriate as a startingpoint. But you should not re-tell the story. will be on how the writer presents his or her material. organised manner, supporting them by means of many brief quotations from the passage. words in the quotations in a way that answers the question. and why they were useful to the writer in achieving a particular effect. checking what you have written. You should not try to be exhaustive. You cannot write about everything in the time available. 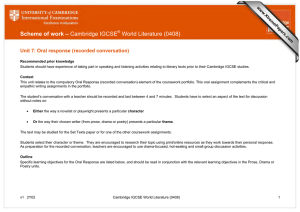 is taken alongside Component 1 Poetry and Prose and Component 3 Drama – Open Text. Read also the general parts of this section for guidance about writing essays. (such as Arial, point 10) and avoid strange or coloured fonts. your two assignments. Don’t give an approximate or abbreviated title. excessively, you are likely to lose focus. from it. Every sentence must add something to your overall argument. Don’t waste time on re-telling the story. In coursework, you have the relative luxury of time to explore in detail how writers achieve their effects. part of your analysis, but don’t use them simply to list features. on the reader (for example, is the narrator trustworthy or not?). ‘suspected malpractice’ (in one word, cheating). types of question you will face in the specific papers. No information is given about particular set texts since these change regularly. offer a personal response to the text and the question set. second-hand ideas (taken, for example, from study guides). thoughtfully, you will have covered the assessment objectives! practice, but you don’t need to revise them. understanding of major themes and ideas. support the points you make in your passagebased and general essays. create a certain response in the reader. answers to be learned by memory. making detailed references to the text. you would prefer to answer! each of the Poetry and Prose sections. studied. You must not answer two questions on the same text; if you do, you will lose marks. You may not take your set texts into the examination. 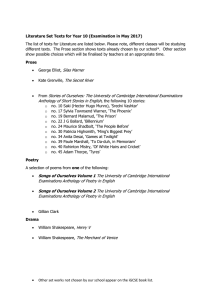 Let us now look at each of the sections in turn: Poetry and Prose. the poems in your chosen poetry selection; there are no short cuts! answers which rely on the simple listing of poetic devices. receive high marks; you must comment on why the poet has used certain words. For each novel or short story text, two types of question are set. passage-based questions in past papers. description and/or dialogue in conveying a sense of character or setting? focus of the question to the front of your mind. cannot remember direct quotations, give references that are as clear and precise as possible. you have studied for this paper. You must answer one passage-based question and one essay question. 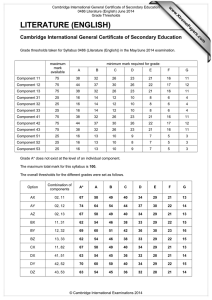 As with Component 1, you may not take your set texts into the examination. For each play, two types of question are set. – all the time keeping your eyes on the question set. products of a writer’s imagination, and not real-life people. merely re-tell the story or give a generalised character sketch. You may refer to clean copies of your drama text. You need to answer one question on one text. questions in past papers to get a feel for the types of question set. writer and his/her intended effects. you will for the set texts papers. comment on relevant aspects of form (that is, poetry or prose fiction). If you are taking the coursework option, the following provides a useful checklist. 3. Texts must be originally written in English, and must not be translations into English. 4. One of the assignments may be on a set text from Components 1, 2 or 3. 5. 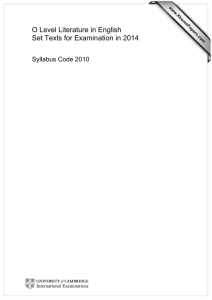 The syllabus recommends that assignments should be between 600 and 1200 words. is no need to compare. 7. You do not need to submit earlier drafts. use a standard font of reasonable size (e.g. Arial, 10 point); do not use coloured or exotic fonts. approximate title or an abbreviated one or none at all! or historical material in your answers! you may not re-write it or change it in any way. treated fairly and all work is marked to the same standard. Although you may use study guides in print and online to enrich your studies, you must not copy from them. instances of plagiarism, and there can be serious penalties if plagiarised work reaches the moderator. an informed personal response which answers the question. you might go about this. Meanwhile the table below sets out the SKILLS you need to master for success. skill. This is just a starting-point for the real work of Literature essays. questions will demand more than that. lead to the most successful answers. you to support your views by clear, precise reference to the text. of view of various characters (including the narrator). or discuss in detail, such issues. use to achieve certain effects. structure and form to create and shape meanings. go beyond the surface level of the writing. All learners should be able to give their views clearly. could not expect to receive the highest marks. A* has to do. Words such as explore, analyse and discuss indicate that a higher order of skills is required. how writers achieve their effects. can help you to write clearly and economically. The table below gives some of the more useful terms. terms as part of your analysis. Just spotting the devices they refer to will not lead to successful answers. You do not need to explain these terms as your teachers and examiners will understand them! The very act of reading this guide shows that you are a serious learner keen to do well. Which examinations am I taking? How many set texts do I have to revise? How long are the examination papers? How many sections are there in the examination papers? How many questions do I have to answer? Is my set texts examination paper ‘open book’ (Component 3) or ‘closed book’ (Components 1 and 2)? what the papers you will take actually look like. or amend notes), your confidence should grow as you learn more and more detail. 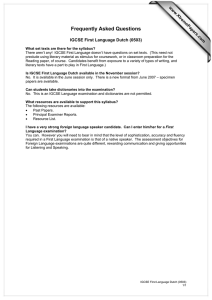 practise the writing skills required in the kinds of questions you will face. Organise your notes, files and study area before you begin the final period of revision. Fill in any gaps. confident about your performance in the examination.